San Diego Padres tickets are very popular with baseball fans. Over the course of team history they have seen some of the best players walk on the field. These players include Tony Gwynn, Trevor Hoffman and Dave Winfield. This year's team is full of talent. Will they make the playoff this year? Get your tickets today! 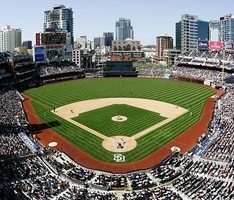 San Diego Padres tickets are easy to get when you buy them from GoodyTickets. With you in mind, we have made it very easy to find the best seats and the best date or dates that work the best for you.